At the request of His Grace Bishop Makarios, Overseer of the North American Archdiocese of the Eritrean Orthodox Church and Bishop of the Eritrean Orthodox Church in diaspora, Abba Seraphim ordained Deacon Habtom Ftuwi, to serve the Medhane Alem Eritrean Orthodox community in Manchester. Abba Seraphim’s contact with the Manchester community goes back to 10 April 2006 when he chaired a meeting at Cheetham Hill to find ways of establishing the incipient community in a regular place of worship. 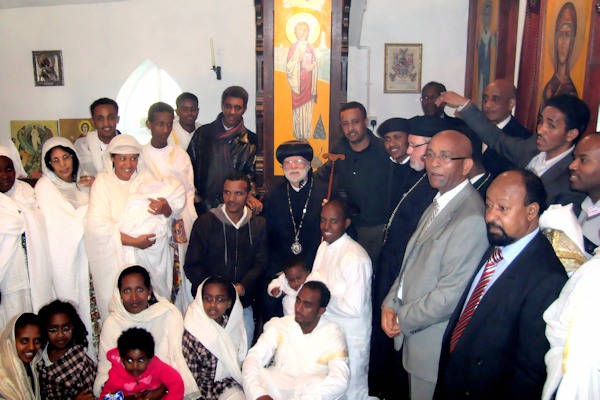 Since then the congregation has grown and maintained regular worship but they have depended on occasional visits (sometimes six monthly) from Eritrean clergy in London for the sacraments. Following Bishop Makarios’ request, Abba Seraphim invited Deacon Habtom and representatives of the Manchester community to meet with him at the British Orthodox Church Secretariat in London and required supporting documentation to ensure the the proposed ordination conformed to canon law. On 19 November the ordination took place at St. Mark & St. Hubert’s Orthodox Church in Cusworth Village, South Yorkshire. During the Liturgy Abba Seraphim was assisted by Fathers Simon Smyth and David Seeds, Archdeacon Alexander Astill, Deacons Christopher Barnes and Johannes Gebrhiwet. A large contingent of the congregation attended from Manchester, so that the church was full. After the kiss of peace, Archdeacon Alexander read out the letters from Bishop Makarios delegating Deacon Habtom’s ordination to Abba Seraphim, before Abba Seraphim asked those present if they wanted Deacon Habtom to be their priest, to which the response was a resounding assent. Finally Deacon Habtom was asked if he accepted this call and his wife, Arsema, whether she agreed to his ordination and would support him in his ministry, to which both assented. Immediately prior to the ordination Deacon Habtom swore the pledge taken by all ordinands to maintain the Orthodox Faith and to serve the people, after which he knelt and bowed to all present. In his homily Abba Seraphim spoke of the Providence of God and our need to bring our wills into conformity with His in the same way that the Mother of God did when confronted by the Archangel. He also spoke of the continuity of priestly ministry throughout the generations and in different places. This very day the funeral was taking place in Dublin of a dear friend, Archimandrite Serge Keleher of the Greek Catholic Church, who died after a long and fruitful priestly ministry. This year also marked the 40th anniversary of Abba Seraphim’s own priestly ordination. On the day of his ordination he had come straight from the funeral of another priest, whose ministry had been over 70 years. Such was the Providence of God that as some priests departed to their reward, others answered the call and served in their place. Abba Seraphim highlighted two scriptural texts, our Lord telling the Apostles, “Ye have not chosen me, but I have chosen you, and ordained you, that ye should go and bring forth fruit” (John X:16) and St. Paul writing about ministers as servants of Christ and stewards of the mysteries of God, “Moreover it is required in stewards that one be found faithful.” He spoke of the prime importance of fidelity to the Faith and to the ministry of service. At the conclusion of his ordination, Father Habtom was invested with his priestly robes and the congregation enthusiastically acclaimed Axios as well as joyful ululations ! At the end of the Liturgy Abba Seraphim gave the new priest the Holy Breath and the traditional charges to a newly ordained priest were read. Afterwards both British and Eritrean joined together in a traditional Eritrean meal in the Battie-Wrighton Memorial Hall, followed by traditional church dances by the choir. As the weather was unseasonably mild this took place in the courtyard in front of the church. 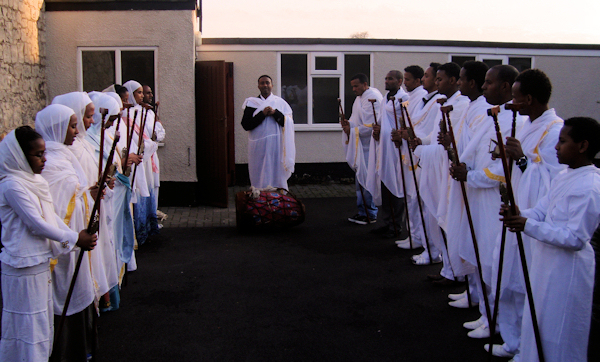 The debteras in their white robes and holding their sistra and prayer sticks swayed rhythmically to these ancient traditional Christian chants from the Horn of Africa while the haunting sounds and the solemn beating of a drum wafted across the sleepy Yorkshire village.